As with all things new its really about learning as you go and expect somethings to change as you learn more. 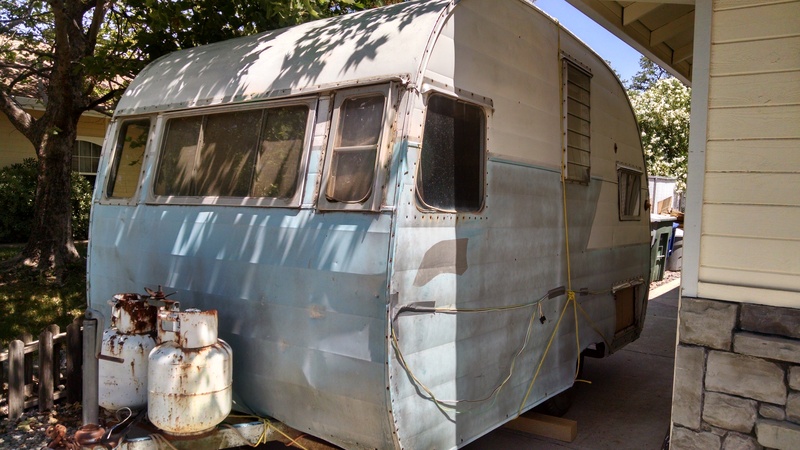 With that said I have learned to expect a lot from our Shasta its 58 years old and it needs some real love. My last post was me replacing the outside floor framing rails. These are the ones you actually mount the exterior wall framing to. Replacing those not so bad. What I did find out is that our trailer is really sagging down on the street side. Anywhere from 1 to 2 inches. 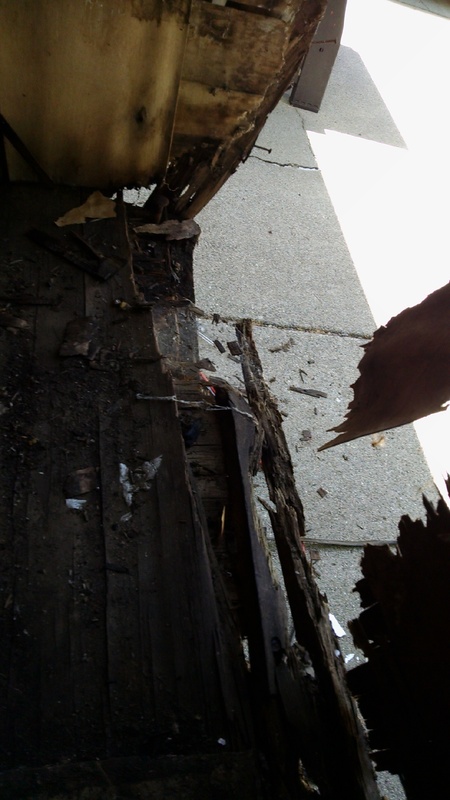 Most of that is from the skirting being all rotted out and not holding the framing up at all. Really not that big of a deal. All the skirting needs replacing and some of the framing so thats what will do. What I hadn’t noticed was that the street side wall was shifted back about a 1/2 inch as compared to the curb side wall. Most would say the frame is bent. The main frame is straight, I would describe that as the frame that is attached to the tongue of the trailer and the other two main rails outside of the tongue. Now some but not all of the outriggers (they are ones mounted across the main frame) are bent and yes they are the ones attached to the framing you attach the walls to. 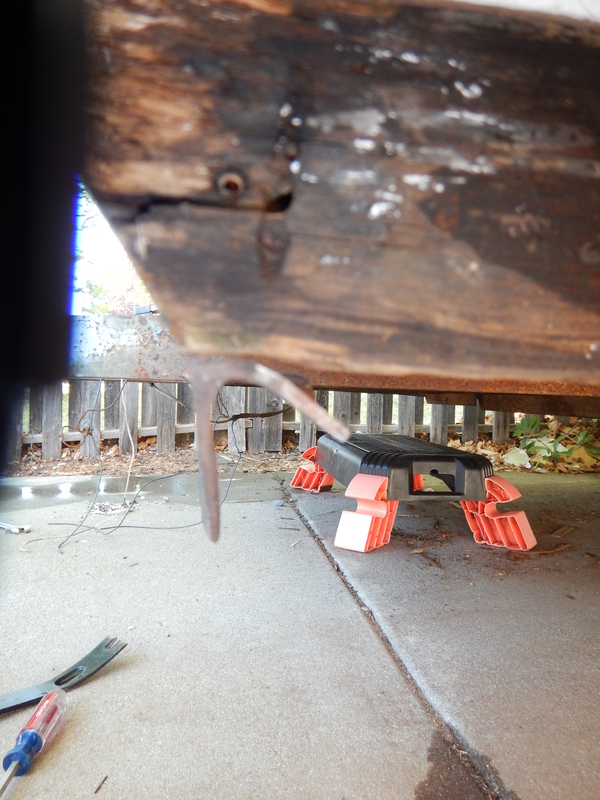 But in my measuring I found that they are bent backward towards the rear of the trailer and if I just straighten them out it will only make the offset worse on the street side. So I will adjust my wall during the rebuild and get the two of them to match as close a possible. 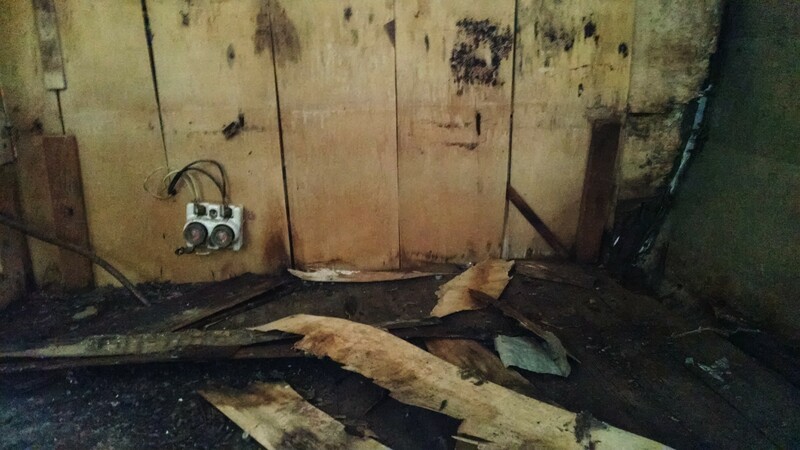 What Im really hoping for is once I remove the roof and the metal siding I will see what shifted the wall back and correct it. 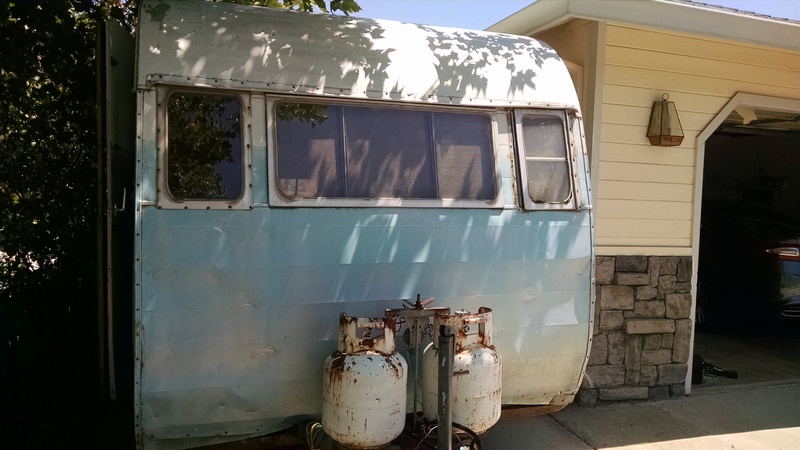 front of trailer on the street side. See how the metal siding is equal to the floor. Well its not the same as the curb side. Thats not good. curb side front. The siding is about a 1/2 inch forward of the floor. One side of my siding is off. So what did I learn from just trying to replace the floor/wall framing rails. I learned that I have a lot more work to do. I was hoping to have just replaced the damaged rails and be on my way to repairing the walls. Well our Shasta has a few years on me and will continue to teach me a few things. This really is just an update on what I should have done before I put the new plywood floor down. As you can see the fronts on both outside floor support are cracked. The back sections of these are fine and not cracked or rotten so I was like it will be fine. I should have just replaced them so now I will. I have the wood cut to replace them. Those floor supports are 2×3 so I just cut a 2×4 down to size. I put a cote of primer on them to seal them up and I will be installing them this weekend. 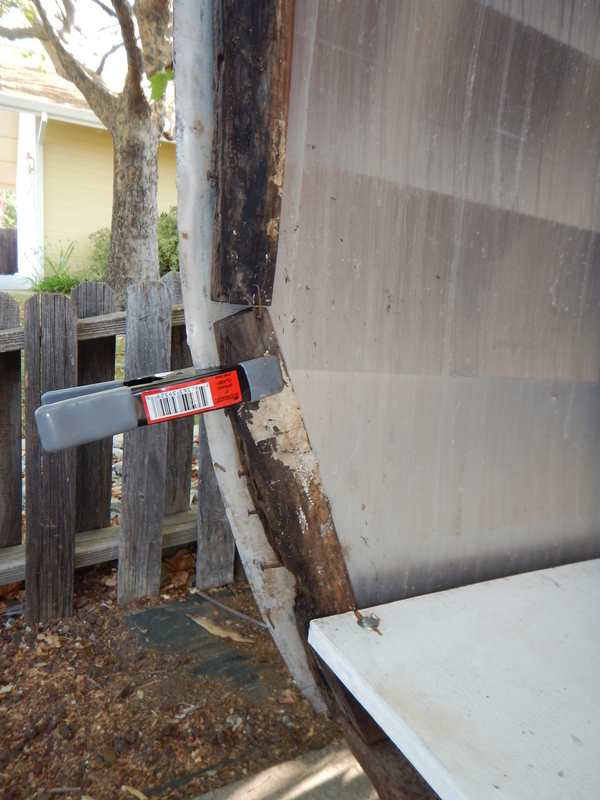 Also Im dealing with wall frame issues where the wall is pushing outward away from the trailer on the streetside. Im debating and have asked if I should remove both the roof and siding or just the siding and do the framing repair before I remove the roof. Since the wall framing is what holds the roof up Im afraid if I remove the siding I may end up with more problems than I have now. I will figure it out Im sure and I will post up what I decided to do about it. 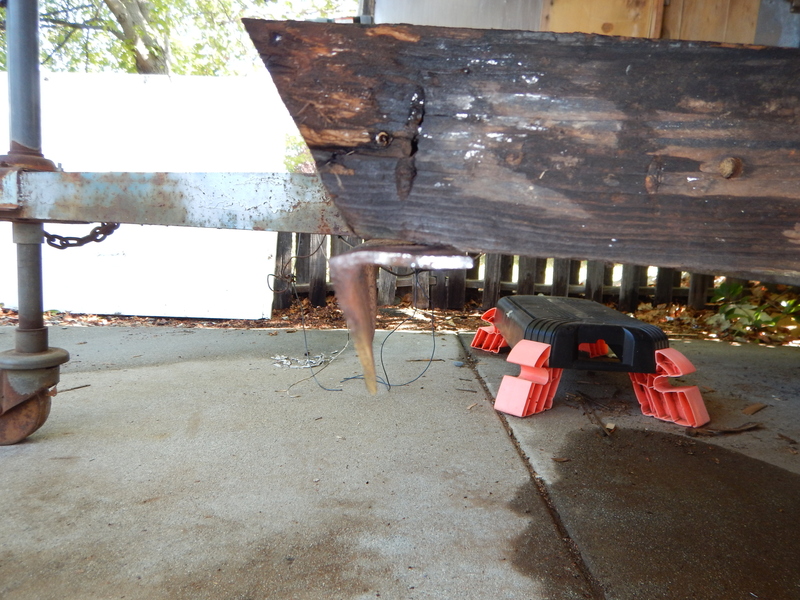 Before I put in the new floor and wall supports back in, I needed to straighten the outriggers. Both the street side and curb side had been damage from hitting something. I was able to fix them by heating the metal up with a propane blow torch and and channel locks to bend them back. Not perfect but way better than before. Thought is was going to be harder to bend them back it really wasn’t that hard. This picture shows the new bracing I put in. The 3 pieces in front I just replaced the old pieces that were there. Believe it or not those pieces were not nailed or screwed to the frame just to the floor itself. The 2 pieces behind those are screwed to the wooden frame rail. Not show in this picture is a piece I put directly in front of the door. 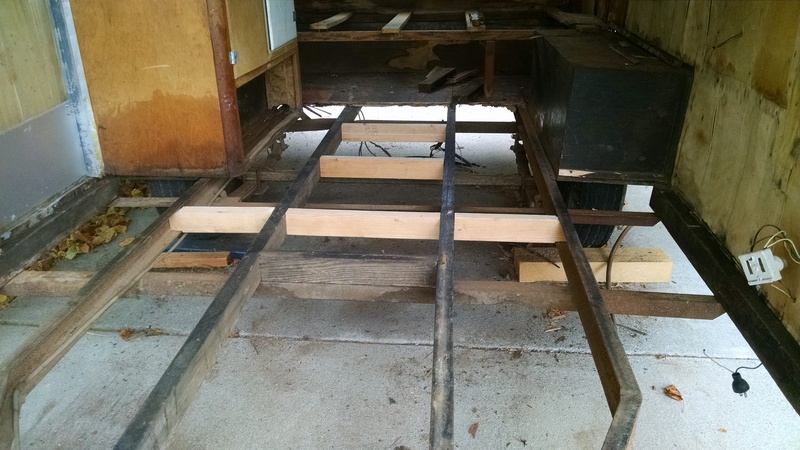 The floor in the trailer needed to be totally replaced. I choose to use a 3/4 inch plywood instead of the sound board and plywood. Getting the old floor out was not all that bad. 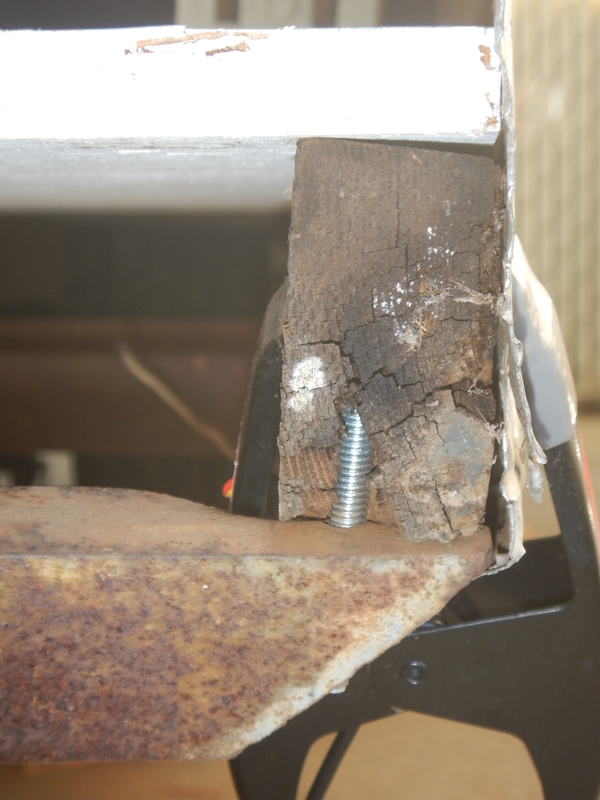 All the bolts holding the floor to the frame were rusted so I had to cut them off from underneath the trailer. I used a sawzall for that. 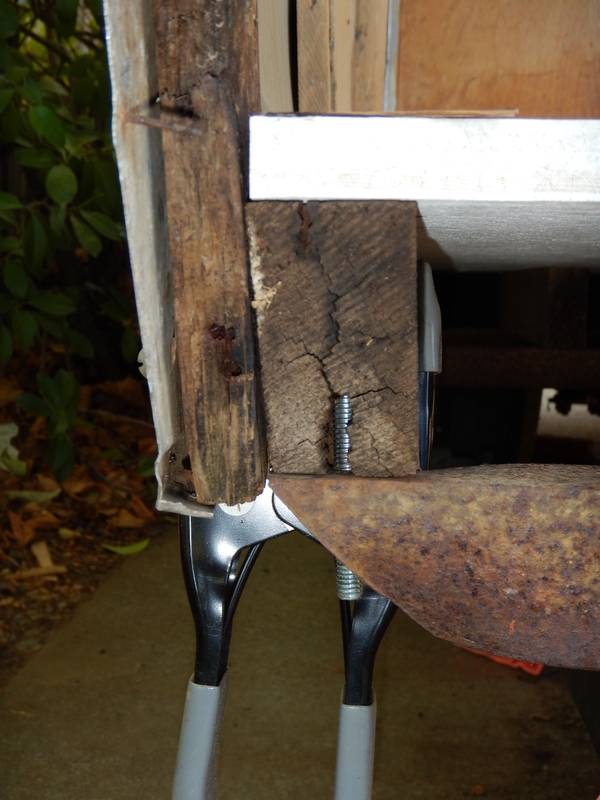 The larger twisty type nails holding the floor down from the inside were much harder to get out. Once we got the floor out, I reinforced the areas in front of the sink and also in the entry. I cut 2 x 4 down to the proper size 2 x 3 to match the ones they used and screwed them in. We sealed the plywood with a white primer sealer first. The 3/4 plywood is about an 1/8 of an inch thicker than the original combination of the plywood and sound board. So getting it under the cabinet next to the door, I had to trim the bottom of the cabinet with the multi tool. I just put the plywood up to it marked the difference in height and cut it off. It slide under it with just a little pushing. 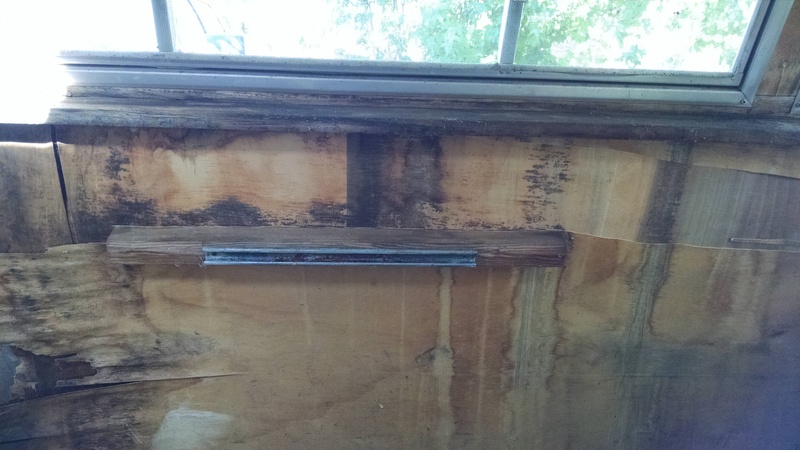 Im sure I could have just removed the cabinet and then put it down but I didn’t want to remove it because it helps support the siding some. 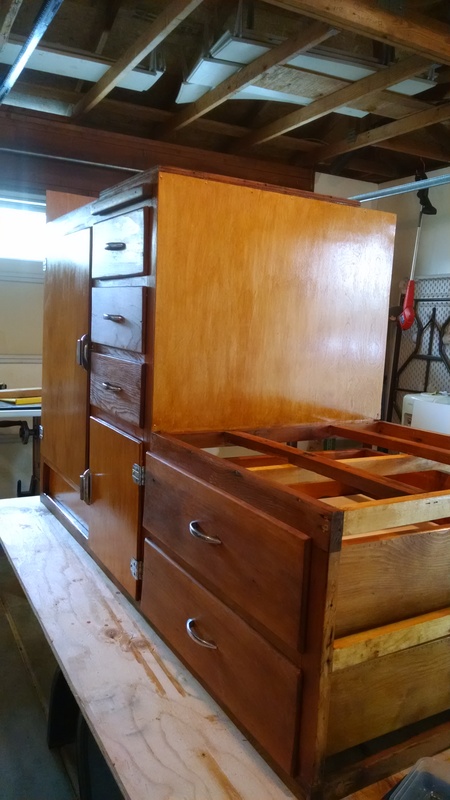 Once I get some of the framing replaced and reattached to the main frame of the trailer Im going to remove that cabinet and do the repairs and refinishing needed. 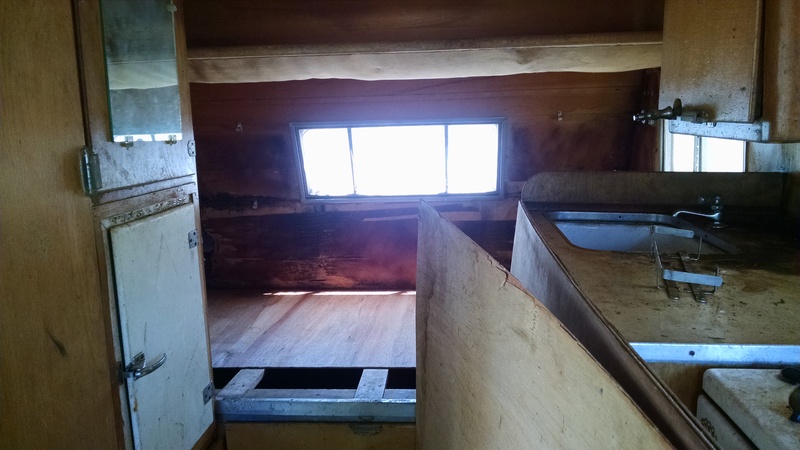 So to do any of the interior repairs and to redo the cabinets we had to remove the front of the trailer. 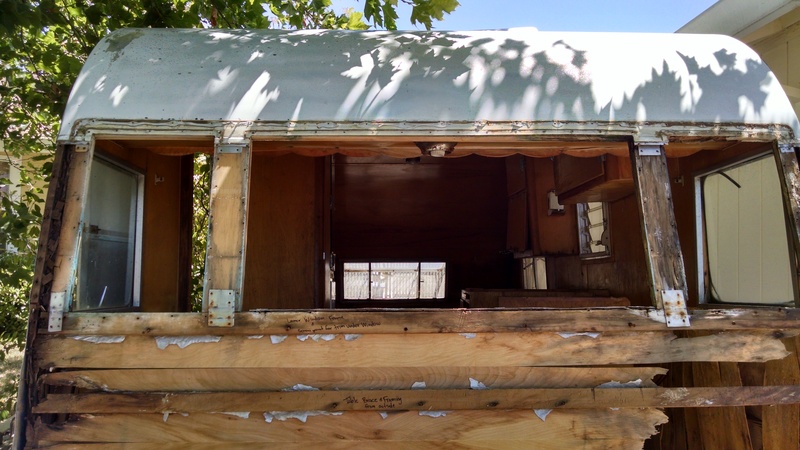 We started off by removing the front windows. It went pretty easy, all the screws came out with no problem. We had notice the the streetside window was not the original window (see picture). Lucky for us we have the correct frame and all the pieces for it so we will be reinstalling it. Remember to take lots of pictures of anything you take apart as reference to either fix or to reinstall. Also have a sharpie marker on hand to mark on things you remove. Both so you know what they are and also where they go. Streetside and Curbside will be your reference and friend LOL, I learned that from watching Larry’s videos http://www.cannedhamtrailers.com. It was a tense moment for LeeAnn and I as we tore out the front. No going back now. Notice the streetside window. Its a crank style mounted sideways LOL. Lucky we have correct one like the curbside window. Picture from inside after we removed the tin. This shows how much water damage Im dealing with. Notice 12v fuse placement . This is on the street side where the table seat would be. This is the table mount. Now the wood is screwed in from the outside and bracket is mounted on the inside. Also the trim under the window is also mounted from the outside. All needs replacing. At this point we decided to remove the cabinet that the sink and stove are in. It needs to be refinished and needed new door skins and some of the frame work had been eaten by rodents so it also needed replacing. Its screwed down to the floor and walls. Most of the screws were so cordoed over or rusted so it took awhile to get them all out. I had to cut the ones mounting it to the floor with the sawzall, I just slipped the blade under the cabinet frame and cut them off. I didn’t have my multi tool at that time or I may have used that. Also getting the stove out was a process. There were 4 screws in the oven that held it down to the cabinet. All of them were rusted over and very hard to get going. Used some spray on them to loosed them up. Still was a job that required lots of patience to get them all out but they did come out. 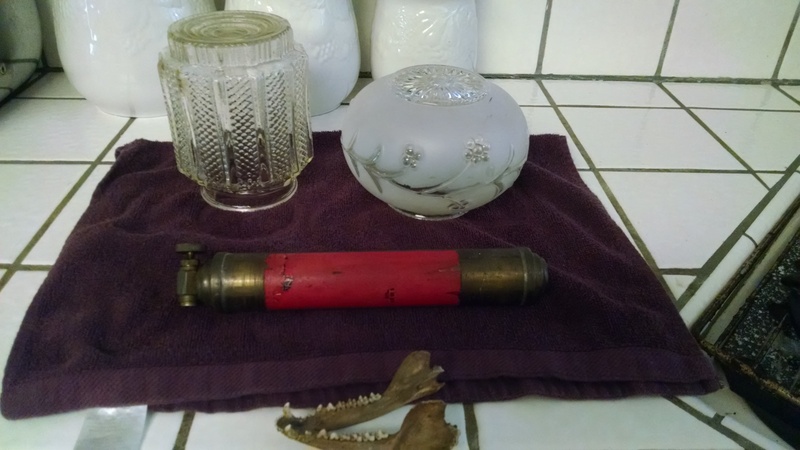 I left the brass pipe for the propane attached to the stove so I had all the pieces together. My wife LeeAnn was in charge of the sanding and staining and I took care of the needed repairs. I had to replace a few brace pieces in the cabinets around the drawers as the were chewed on by the rodents and one door skin. 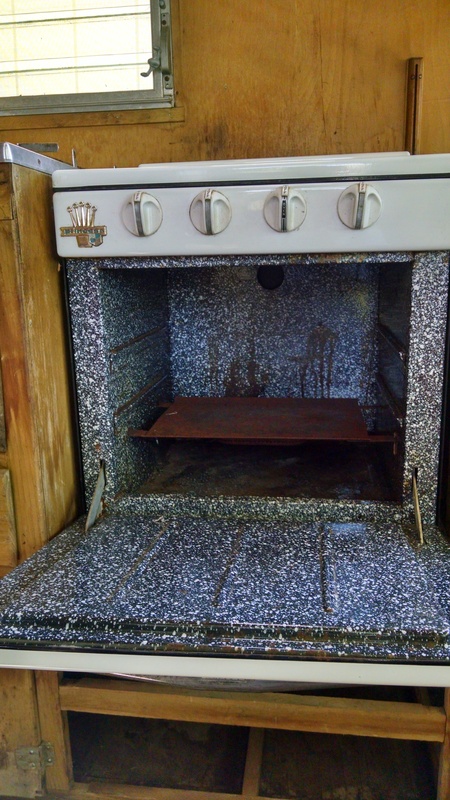 I also replaced the birch panel end pieces at the end by the sink and the pieces around the stove, they wear really damage bad and nasty looking. 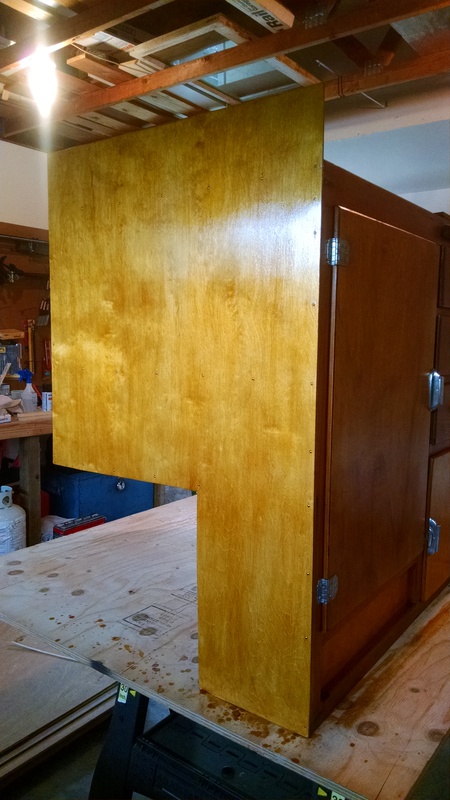 I also had to make two new shelf’s that are under the sink and I replaced all the drawer bottoms with panel that I found at Home Depot, its has a white laminate on it and was the correct thickness of the old plywood that was used. The sanding went easy. When we tested the color for the Shellac ( we used Amber) the color looked like the old stuff did. But the new birch panels we replaced came out alot lighter than we expected. We even made sure we did the same amount of cotes on all the wood. Were going to see how the rest comes out and if needed will go back and redo cabinet frames and try and make them match closer. We polished the old drawer handles up with #000 steel wool and they look almost new. Sink end birch panel replaced. It was originally two different pieces. I chose to make it one piece instead. 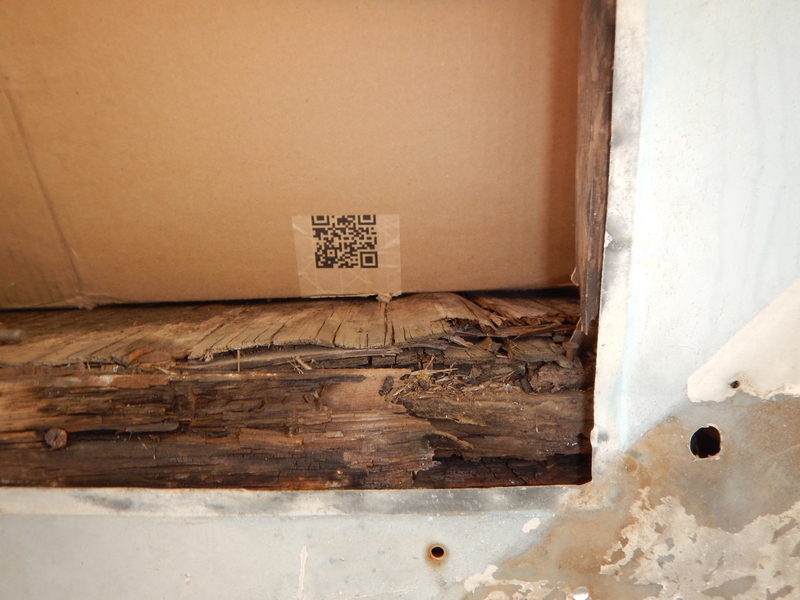 As you can see the original wood is pretty dark compared to the pieces we had to replace. The small door and the kick panel at the bottom are new birch. 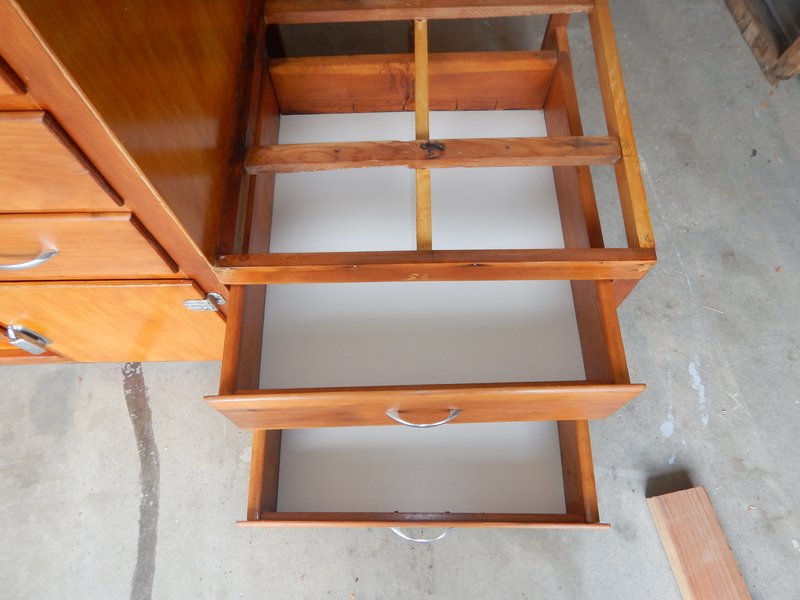 I’ll post up more pictures of the drawer repairs I did so you can see them. Will continue to remove the rest of the cabinets and get them done. 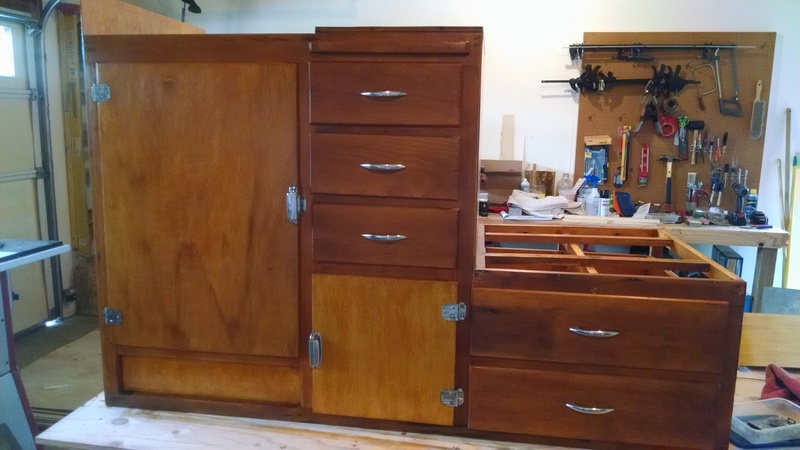 We have all the doors off all the cabinets and have gotten the same dark results from the Shellac. Were guessing its just the age difference between the new birch panels and old ones. we replaced the shelf’s under the sink with a cabinet drawer laminate I found at Home Depot. A 4×8 sheet was about $12.00. 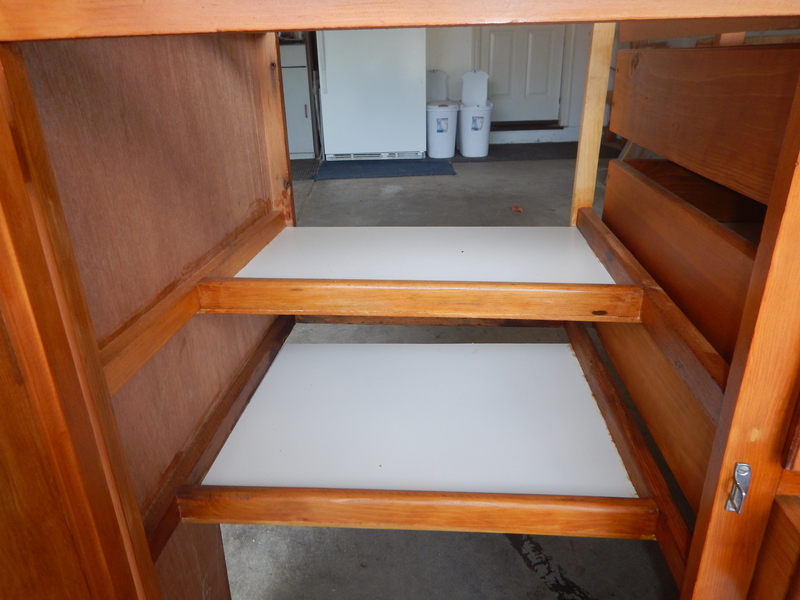 New drawer bottoms for under the stove and also a couple new pieces of wood for the cabinet itself. Now that we have the trailer home and still all in one piece its time to clean out and really see what we have gotten ourselves into. We gloved up and masked up and away we went. 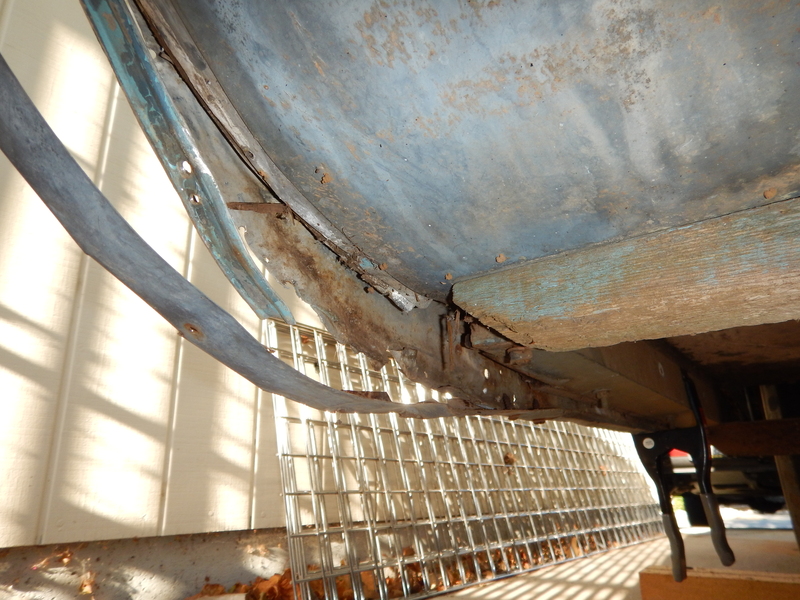 Good news we found the missing interior vent frame, one complete window frame and the tin and frame parts for one of the exterior cargo doors. Bad news way more water damage and rodent damage than i had hoped for. It took about 2 hours to remove and shopvac out all the rodent nest and you know what out of it. But now we can see what we have to work with. 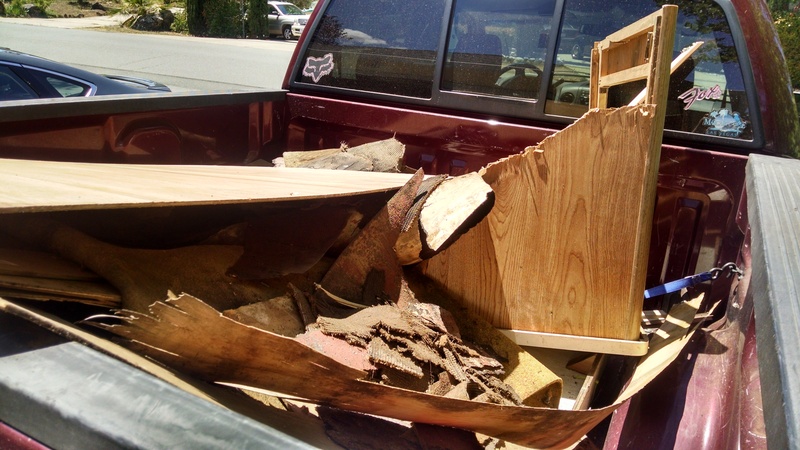 Just some of the stuff we removed from inside the trailer. Sink cleaned up nicely and counter not half bad but we are replacing the counter top. Old paneling someone was going to do repairs with ( not even birch, just door skins).You can see the cot style bed just above the main bed. 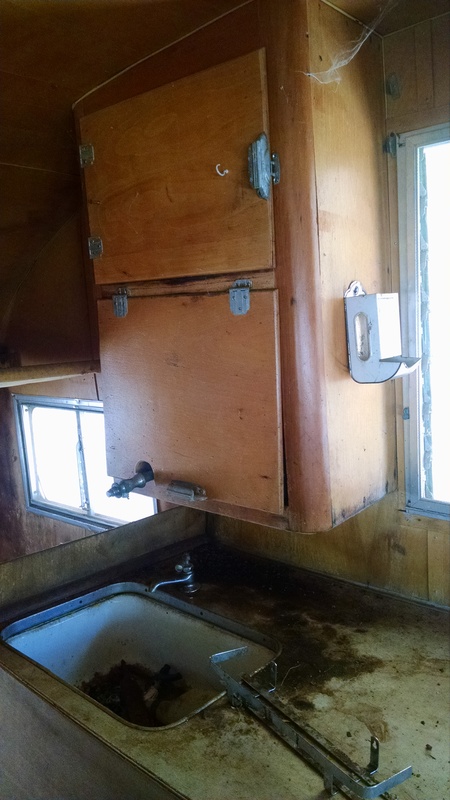 Above the sink is where the original water storage tank is, the water dispenser is sticking out of the cabinet. Spice rack and the white thing on the side of the cabinet is for matches for lighting the stove and propane light over the table. 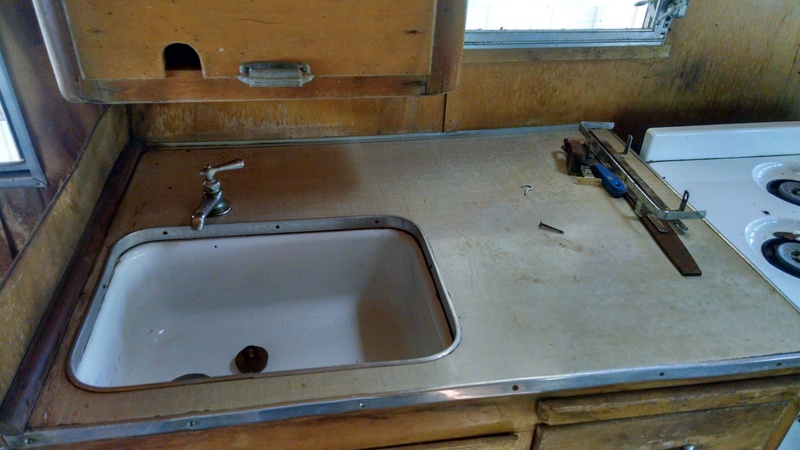 The sink,ice box and stove are in great shape. 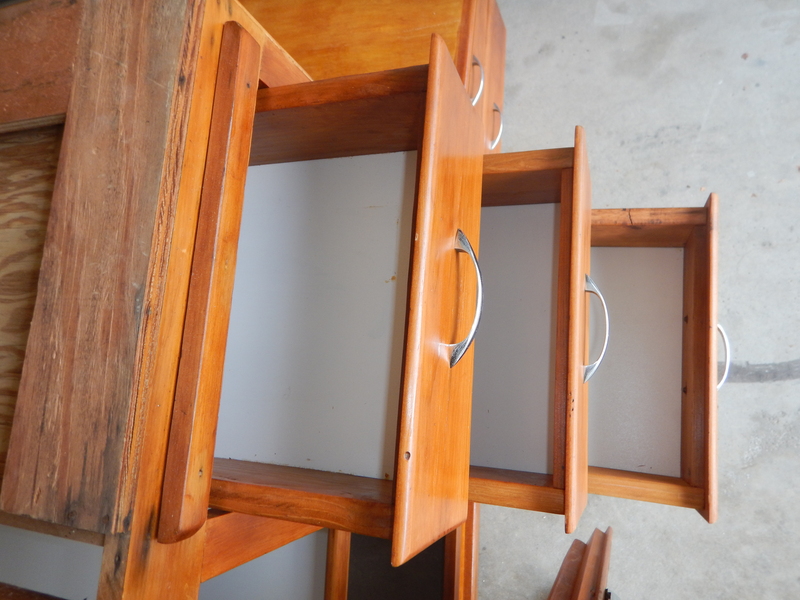 The cabinets will need some panels replaced do to water stains, rodent chomping and 58 years of wear and tear. 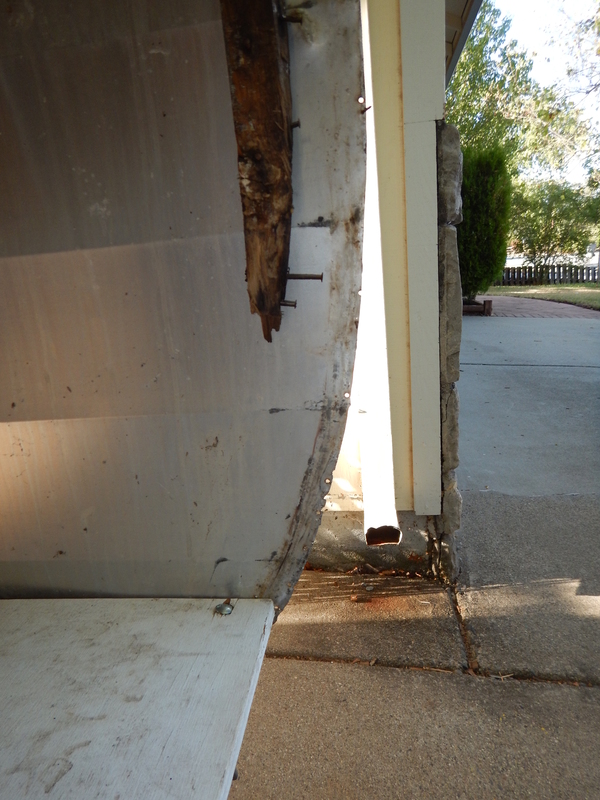 If your a Shasta owner you know the leakage problem areas and the damage that causes. Well ours has it in all 4 corners up to the windows across the front and across the rear. The floor is soft in some spots and has a large hole in it near the sink cabinet where the rodents chewed through it. Deep breath and now lets do this…..
A little introduction about myself and our Shasta. My name is Mark. 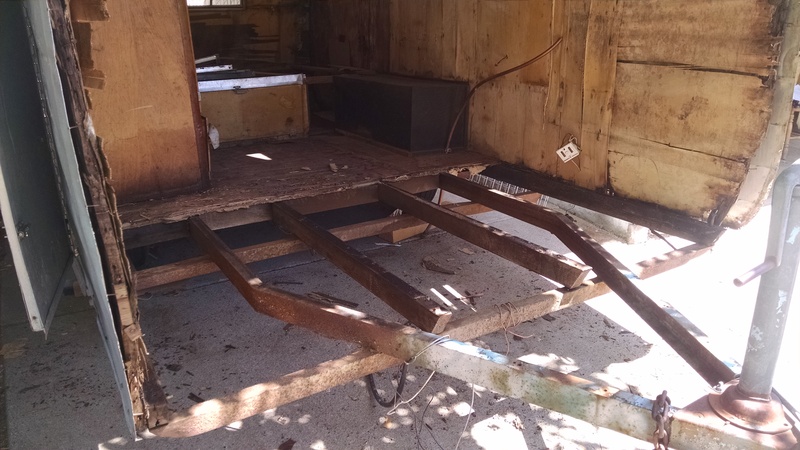 First off I have no previous experience with any trailer restoration or repairs . So this is all new for me. I do have a good background in working with wood and other tools. Im not afraid to get in and get dirty and do research and ask lot of questions when I don’t know. Our excitement for a vintage trailer started on my way home from work one day. With my wife in her car ahead of me a vintage trailer pulled out onto the street just ahead of her. I immediately feel the force of the Vintage Trailer. Our search started that evening. Within 5 minutes of looking on craigslist we located one in our area 20 minutes away. We drove up on Memorial Day and towed it home. Purchased from the original owner who bought it new. Pink slip shows it being built in 1956 sold as a 1957. Its a 14 foot compact ( no wings those came after our model year from what I have been told and from the research that I have done). The last time the trailer was used was in 1977. We had a nice visit with the owner and his son and heard all about the great family vacations spent in this trailer. Up to 6 boys and there parents slept in this trailer Really 8 people in this tiny thing). So our eyes were a little blinded by all the great stories told. Now I looked inside and I somehow convinced myself we can fix it, get it back out and making new memories.